We expect goblins, ghosts, and ghouls to roam the streets on All Hallows Eve; what we don‘t expect is murder. October 31, 1957 was a school night, kids scored their Butterfinger bars and homemade caramel apples and were home in bed by a decent hour. Thirty-five-year-old Peter Fabiano, his wife Betty, and teenage stepdaughter, Judy Solomon, had just retired for the night. Peter’s stepson, Richard Solomon, had left earlier to return to his Navy base in San Diego. The family wasn’t expecting any callers when the doorbell rang shortly after 11 p.m.
Peter got out of bed and went to the door. Betty heard him say “Yes?” Then he said, “Isn’t it a little late for this?” She heard, but didn’t recognize, two other adult voices, “One sounded masculine and another like a man impersonating a woman.” Then Betty hear a noise that “sounded like a pop.” The noise brought her and Judy out of bed in a hurry. They ran to the front door where they found Peter lying on his back just inside the front door. Judy ran two doors down to Bud Alper’s home. 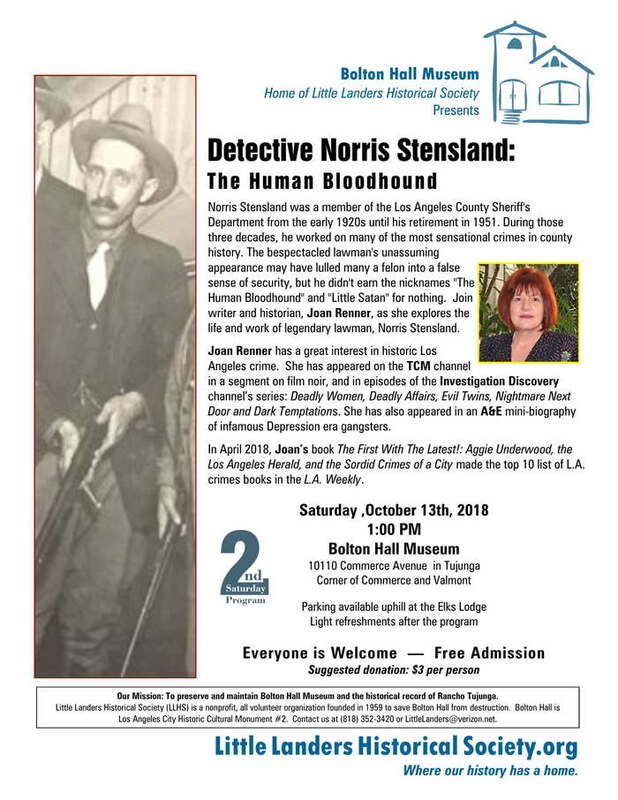 Judy knew Bud was a member of the Los Angeles Police Department, assigned to the Valley Division. She banged on the door until Bud answered. Bud contacted Valley Division and several officers arrived within minutes to the scene of the shooting. They transported Peter to Sun Valley Receiving Hospital where he succumbed to massive bleeding from the gunshot wound. A fifteen-year-old boy witnessed a car leave the neighborhood at a high rate of speed around the time of the shooting. He had no other information for police. Detectives found no spent shells, nor did they find evidence that the shooting was part of an attempted robbery. Betty told them she and Peter married in 1955. Together they ran two successful beauty shops and as far as she knew he had no enemies. Peter’s murder resembled a gangland hit, so the police dug into his background. Peter had a minor record for bookmaking in 1948–nothing that connected him to L.A.’s underworld. Detectives interviewed friends and relatives of the deceased, but they offered nothing in the way of suspects. A week later a confidential tip led detectives to a bizarre murder plot. Goldyne Pizer, a 43-year-old widow, admitted to the slaying when arrested at her Hollywood home. Goldyne told LAPD Detective Sergeants Charles Stewart and Pat Kelly, “It’s a relief to get it off my mind.” She said a friend of hers, 40-year-old Joan Rabel, a former employee at one of Fabiano’s beauty shops, talked her into committing the crime. On September 21, Goldyne purchased a .38 special from a gun shop in Pasadena. She told the man behind the counter she needed the weapon for “home protection.” A few days later Joan drove Goldyne back to the shop where they picked up the gun with two bullets in it. Joan paid for the gun, but Goldyne kept it until Halloween night when Joan picked her up in a borrowed car. The women waited until the lights went out. Goldyne said, “I rang once and when nothing happened rang again.” She brought the gun up with both hands and fired. Rather than face trial, on March 11, 1958, Goldyne and Joan pleaded guilty to second-degree murder and sentenced to 5 years to life in prison. What about a motive? Why did Joan want Peter to die? Simple. Peter stood in the way of Joan’s plan to get much, much closer to Betty. Before his death, Peter asked Betty to end her friendship with Joan, which she did. The newspapers alluded to the motive. 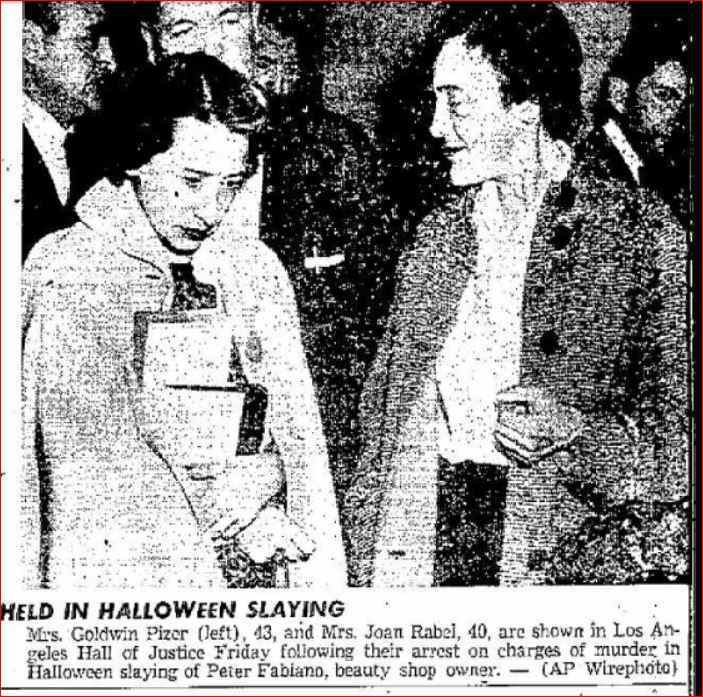 Reports described Joan as jealous of the Fabiano’s relationship—1957 readers did not need to have it spelled out for them. They understood the subtext. Homosexuality was illegal in California—which may be why Joan accepted a plea deal. I don’t know when Goldyne and Joan left prison–but I hope they spent a long time behind bars. It appears Betty never remarried. She died in 1999.